Each year, cell phone owners collectively spend over a billion dollars on cell phone repairs. In fact, recent studies have reported that one-third of cell phones will require repair at some point during their lifespan. Whether the repair has been caused by human error or a flawed design, there are several reasons a cell phone may need to be repaired. Here are the 5 most common cell phone repairs. Cell phone screens are delicate. This is the primary reason that people purchase high-quality screen protectors. A cracked cell phone screen is unsightly, and it affects your ability to see incoming call numbers and text messages. 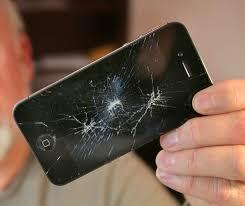 Cracked screens account for over half of all cell phone repairs. Cell phones don’t stand a chance against water. After a cell phone has been immersed in a liquid, the internal circuitry can get damaged. Depending on the extent of the damage, it may be more cost-effective to replace the phone. Since many cell phone warranties don’t cover repairs or replacements, you may be required to purchase another phone. It’s always a good idea to keep your cell phone away from liquids. Less than 10 percent of cell phones require repair because they fail to connect to LAN, Wi-Fi or Bluetooth. This may be due to a defective receiver. It isn’t uncommon for owners to have to replace cell phones that experience these problems. After you recharge your cell phone’s battery, there’s only a limited amount of time that you can use it before it requires another recharge. If the charging cable in your phone isn’t working, it will be impossible for you to charge the phone. Less than 10 percent of cell phones experience this problem. What good is a cell phone if you can’t hear the person on the other end of the call? Believe it or not, approximately 5 percent of cell phones require repair due to a faulty audio output. Audio components that frequently malfunction include the microphone, speaker, headphone socket and ringer. This is especially annoying when you are in the midst of an important conversation. To correct this problem, repairers may have to keep the phone overnight. This is especially true when the repairer can’t determine the problem immediately. Unless you have received training in cell phone repair, it’s a good idea to contact your service provider or a certified repairer if your cell phone requires any of these repairs.